This week’s transport beauty stands largely unremarked in a rather unremarkable building, the northern ticket hall of the recently redeveloped Blackfriars station in London. Unlike many other new or rebuilt major railway stations around the world, Blackfriars is rather modest. There are no Liège-style theatrics going on here, no St Pancras International restoration of a historic station to its former glory, no big-name architect showing off his or her skills. That’s not to say that the redeveloped Blackfriars station, which opened in 2012, doesn’t have its points of interest. The redevelopment saw the station extended all the way across the adjacent bridge which carries the railway over the Thames. As a result, it is the only London station with an entrance on both the north and south banks of the Thames. The roof, a series of repeating north-facing windows, carries photovoltaic cells on the south facing ridges, and the station generates about half of its power needs itself. The station has been rebuilt as part of the ongoing Thameslink Programme, a project which should see the north-south rail through London upgraded to meet increased demand for travel, by 2018. The Thameslink Programme was originally called Thameslink 2000, after the project’s intended completion date. The privatisation of the British railway network, coolness on the part of infrastructure company Railtrack, general all-round governmental uselessness, and planning issues all conspired to delay the project by nearly two whole decades. 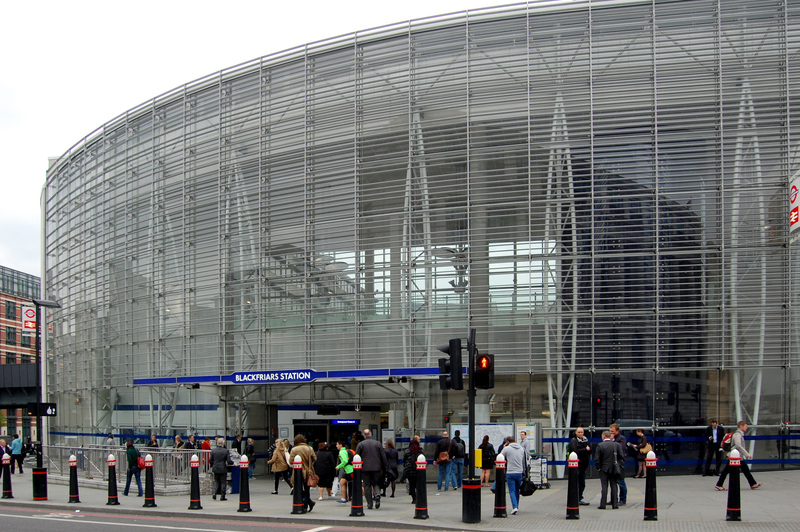 One of the main planning problems was that proposed designs for new buildings – like the ones at Blackfriars – were not considered adequate by the planning inspector who considered Railtrack’s applications. It’s the kind of thing that leads to buildings which seek to blend in, rather than stand out. To hunker down, rather than proudly draw the eye. So it is at the Blackfriars ticket halls. Both of them are clean, bright, modern and perfectly acceptable. Both of them are essentially forgettable. With one important exception. Stand within the northern ticket hall at Blackfriars, and you can see one of the hidden gems of the modern railway network. Ignored by commuters dashing past on their way to or from work, you can stand in front of a gigantic deep blue glass tower. To gaze at it close up is to lose yourself to its inky ultramarine depths. It is of the same beautiful deep blue glass that draws the eye and fascinates the imagination as Victorian poison bottles. Such bottles, in good condition and of a rare design, now change hands for good sums of money. They speak of a time when illiteracy meant that poison had to be stored in bottles easily identifiable by non-readers, hence their deep blue colour. They are reminders of a pre-penicillin age when a simple infection could bring you low, spread throughout your body, and kill you outright. 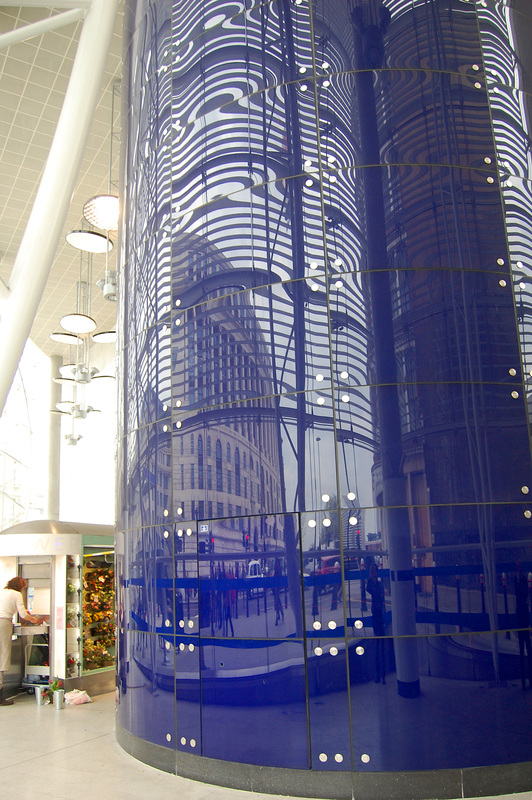 The Blackfriars blue pillar stands, aloof but alluring, challenging you to appreciate its vast scale while not losing yourself in hypnotic contemplation. It’s really an extraordinary thing to be up close to, its hues simultaneously cool and strangely disturbing. It’s the monolith of Clarke’s 2001: A Space Odyssey, a dangerous sentinel operating on levels far beyond that of its immediate surroundings. The fixings for the glass panels, one at each corner, create a repeating pattern of silver squares across its face. But the more you look, the more they seem to float on it, sometimes in front, sometimes within. It’s actually a ventilation shaft for the London Underground Blackfriars station below, drawing up noxious vapours from below ground, venting Victorian miasma into the twenty-first century sky. The poison bottle simile is entirely apt. 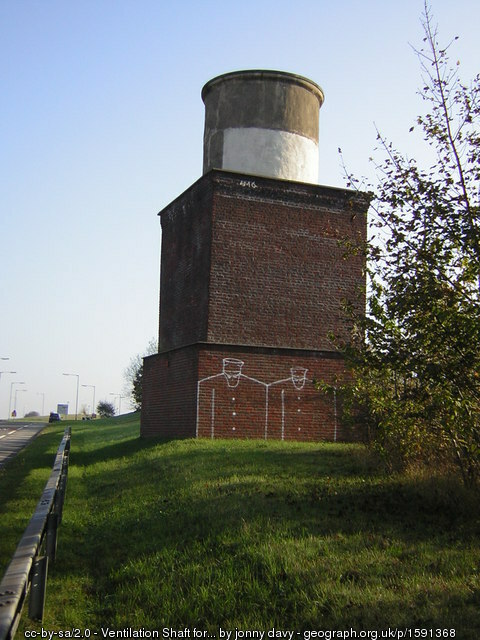 The Blackfriars ventilation shaft is another example of the fact that even the most mundane pieces of transport infrastructure can be transformed into things of great beauty with the application of some thought and engineering ingenuity. 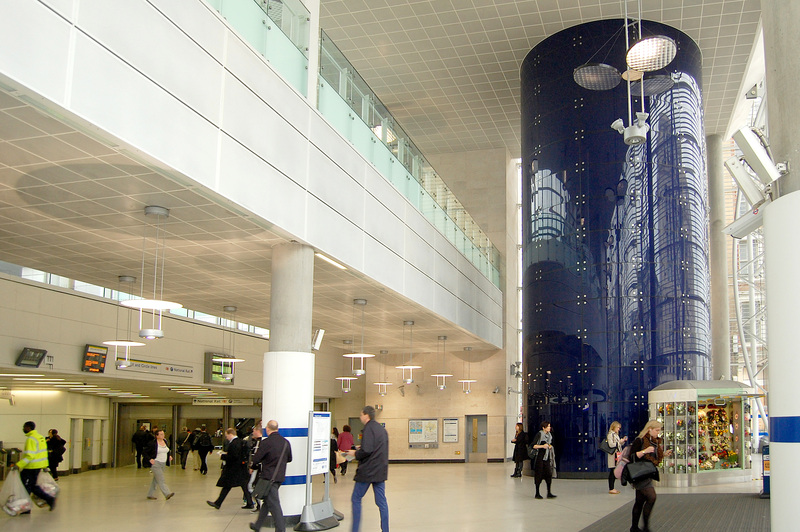 In this case, the curved blue glass panels which are the essence of the shaft’s appearance were made by Glassolutions, and are designed to meet modern international standards for blast mitigation, especially important when you consider that the ventilation shaft might be the line of least resistance of a blast wave emanating from an explosion in the Underground station. Such are the events we have to contemplate in a post-7/7 (and 9/11) world.